Miami's Best Psychic Alexis Reyes, Psychic Life Coach & Medium. Imagine being married for 70 years. Think of what you would see, who you would meet… How has it lasted so long for John and Lauretta “Honey” Myers? We got the scoop on how to make a marriage last. What’s the key to a successful marriage? They met when she was 18 and he was 21. John recalls how they met at a roller skating rink in Toledo, when he took her down to the ground, knocking her out. When she came to, John never left her side. 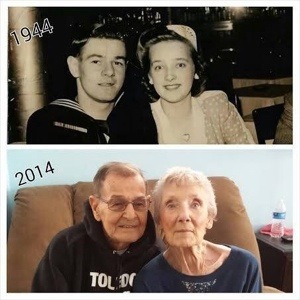 Here they are celebrating 70 years of marriage. What has kept their marriage going this many years? “Give and take. Yep, that’s right. Give and take,” said the two love birds. But, what if they get mad at each other? “When you get mad, you gotta make up — that’s it,” said John. “Right! I can argue with him, and the next morning I get up, and it’s like nothing ever happened,” said Honey. Just sitting with John and Honey, you can tell they still love each other today as much as they did the day they got married. So if it’s true love, what exactly does that mean? “True love is when there’s something wrong with her and you take care of her and try to do the best you can,” John explained. John and Honey’s love story includes two children, five grandchildren and nine great-grandchildren — with another on the way. They say that is what makes them their happiest. But, this tale doesn’t end here. It’s not just a celebration for John and Honey. It’s a celebration for anyone who’s in love. You can wish this couple a happy anniversary by joining their family as they collect cards from across the country to celebrate the milestone on April 12. Learn how you can be part of the surprise for Honey and Grandpa.